My Drl relay is on the driver side left so im assuming unplug that before installing new diode. I'm also assuming that the diode is not too far from the drl relay or is it in behind the glove box? I can only relate to my former 2001 Civic. The DRL Module (which has a number of INTERNAL relays) was on the Drivers Side under the dash and it had bad solder joints on the Printed Circuit Card. The DRL Relay (the one that blows the 10 Amp Fuse) was mounted in a plug in base located behind the Glove Compartment of the Passengers side. The DRL Relay would chatter because of the bad solder joints in the DRL Module up until the time the Diode shorted out because of the EMF across the DRL Relay coil. The snubber diode is a diode that goes across the coil of the DRL Relay. The DRL Relay was mounted behind the Glove Compartment on the 2001 Civic. I think you are on track with your thinking, but I can't figure out what of relevance is located behind the glove box? 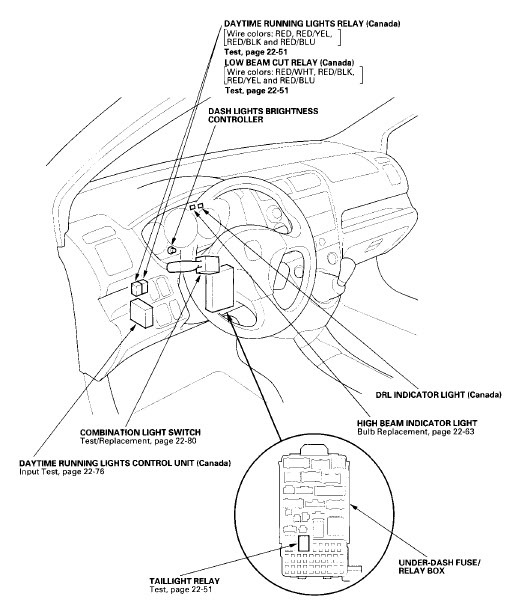 I see from this drawing the DRL Relay is on the Drivers Side, on the 2001 Civic the DRL Relay was behind the Glove Box. That is confusing to say the least.